Companies love quick promotional gifts that stay in the hands and minds of potential customers. That’s why custom gel pens are ideal for affordable and effortless advertising efforts. Check out our click pens for when you need to get to business quick, or gel pens that write in rainbow ink and show off your brand's creative side! ePromos carries pens in many colors and styles, perfect for every type of consumer. For a small giveaway that offers repeat brand exposure, our gel pens are ready for customization! Putting your company logo on this curvaceous gel ink Promotional pen will sure to turn some heads. This custom pen has amazing smooth-flow gel ink. Retractable promotional pen with gel ink and intense color options. A great promotional gel pen with rubber grip. A great promotional gel pen with a translucent barrel and white rubber grip that's available at a great price! These great gel custom pens features a textured rubber grip that's provides additional style, comfort and unbeatable price point to accommodate your marketing budget! This custom gel pen has amazing smooth ink. 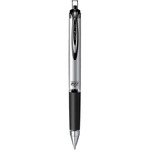 The promo BIC Velocity Gel retractable custom pen features vivid, fade-resistant gel ink. This Soft Touch Rubberized Custom Hybrid Gel Pen features smooth writing hybrid gel ink. The rubberized body adds a soft touch for a comfortable grip. The soft-touch and vibrant colors of this Retractable Gel Custom Pen will make it be your new favorite! Comfortable to use as a stylus and a pen, this Soft Touch Instant Dry Gel Stylus Custom Pen features gel ink that dries almost instantaneously! Most people have a single trusty pen on hand for quick note-taking and jotting down other information throughout the day. Why not give your customers a favorite pen -- an imprinted gel pen that they will keep on hand, day after day? With personalized gel pens, customized by ePromos, you’ve made the right decision with an affordable marketing solution that pays for itself with brand equity. Another thing to remember, ePromos has FREE Shipping on every pen we sell! For an effortless and enjoyable writing experience and when crisp lines are an absolute must, gel pens are the perfect everyday writing instrument. With high-quality pens, it's easier to work harder, smarter and more quickly. Gel pens create notes that stand the test of time without fading. Advertising ink pens use ink in which pigment is suspended in a water-based gel. Because the ink is naturally thick and opaque, it's easy to make color-saturated, expressive lines on a variety of surfaces. When the ball rotates, it provides a smooth, easy glide for quick, simple notes or lengthy letters. The writing is free of skips, splatters, and smears. Gel also shows up more clearly on dark or slick surfaces than the typical inks used in ballpoint pens. Many gel inks are water resistant once the ink has dried. Look to ePromos for different sizes, colors and shapes including javelin, contour and easy-hold pens. In addition, look for your favorite type of grip, too. You’ll find variations of rubber and plastic grips to keep our hand steady. Only the finest pens come from ePromos because we carry brand names such as BIC®, Paper-Mate®, uni-ball®, Zebra®, Scripto® and more. Depending on the gifts you choose, you can have your pens decorated with the imprint method of your choice: screen printed, pad printed, debossed or laser-engraved. These easy-writing promotional gel pens are the perfect gift - versatile for any industry, useful, and a great way to spread awareness for your brand. Customize yours today.